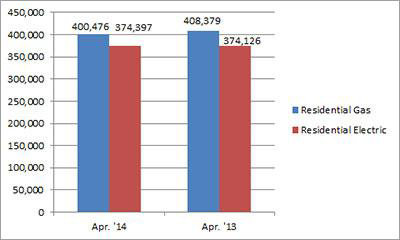 U.S. shipments of residential gas storage water heaters for April 2014 decreased 1.9 percent, to 400,476 units, down from 408,379 units shipped in April 2013. 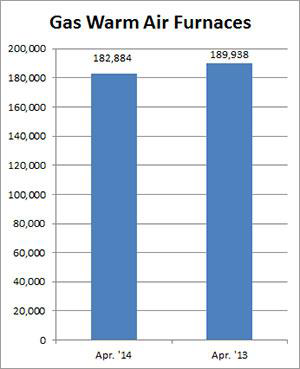 Residential electric storage water heater shipments increased 0.1 percent in April 2014, to 374,397 units, up from 374,126 units shipped in April 2013. For the year-to-date, U.S. shipments of residential gas storage water heaters increased 3.9 percent, to 1,563,455, compared to 1,505,451 units shipped during the same period in 2013. Residential electric storage water heater shipments increased 5.2 percent year-to-date, to 1,472,050 units, compared to 1,399,874 units shipped during the same period in 2013. Commercial gas storage water heater shipments increased 12.2 percent in April 2014, to 8,852 units, up from 7,888 units shipped in April 2013. 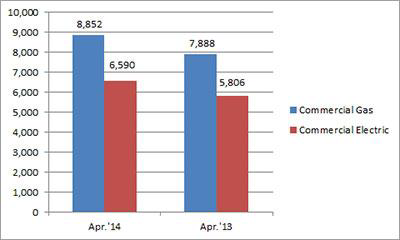 Commercial electric storage water heater shipments increased 13.5 percent in April 2014, to 6,590 units, up from 5,806 units shipped in April 2013. Year-to-date U.S. shipments of commercial gas storage water heaters increased 3.6 percent, to 33,557 units, compared with 32,396 units shipped during the same period in 2013. Year-to-date commercial electric storage water heater shipments increased 12.7 percent to 24,735 units, up from 21,957 units shipped during the same period in 2013. U.S. shipments of gas warm air furnaces for April 2014 decreased 3.7 percent, to 182,884 units, down from 189,938 units shipped in April 2013. 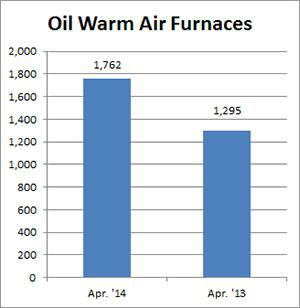 Oil warm air furnace shipments increased 36.1 percent, to 1,762 units in April 2014, up from 1,295 units shipped in April 2013. Year-to-date U.S. shipments of gas warm air furnaces increased 7.1 percent, to 783,351 units, compared with 731,673 units shipped during the same period in 2013. Year-to-date U.S. shipments of oil warm air furnaces increased 10.9 percent to 9,347, compared with 8,432 units shipped during the same period in 2013. U.S. shipments of central air conditioners and air-source heat pumps totaled 648,404 units in April 2014, up 2.6 percent from 632,187 units shipped in April 2013. 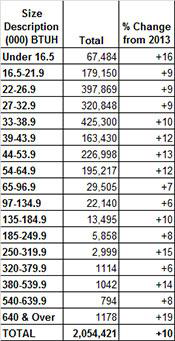 U.S. shipments of air conditioners increased 1.6 percent, to 433,078 units, up from 426,184 units shipped in April 2013. U.S. shipments of air-source heat pumps increased 4.5 percent, to 215,326 units, up from 206,003 units shipped in April 2013. 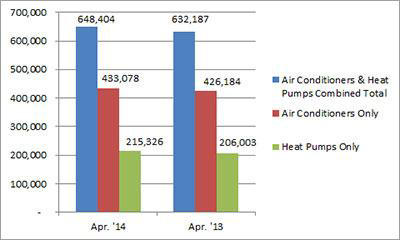 Year-to-date combined shipments of central air conditioners and air-source heat pumps increased 10.4 percent, to 2,054,421 units, up from 1,861,434 units shipped in April 2013. 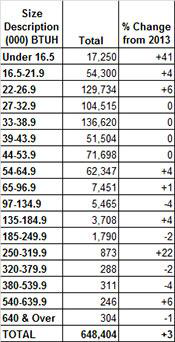 Year- to-date shipments of central air conditioners increased 7.3 percent, to 1,304,904 units, up from 1,215,772 units shipped during the same period in 2013. The year-to-date total for heat pump shipments increased 16.1 percent, to 749,517 units, up from 645,662 units shipped during the same period in 2013.